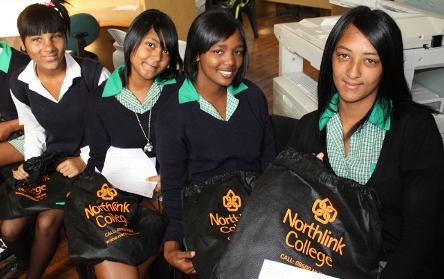 Northlink College is one the largest further education and training (FET) colleges in the country, with over a decade of experience in shaping students’ minds. The College is situated in the Northern Suburbs of Cape Town in the Western Cape Province. With seven campuses (Belhar, Bellville, Goodwood, Parow, Protea, Tygerberg and Wingfield) the College gives prospective students the opportunity to study further with the help of the bursaries that are awarded by the National Department of Higher Education and Training (DHET) and managed by National Student Financial Aid Scheme (NFAS) which a student can apply for. The bursaries are specifically for students enrolling for the National Certificate Vocational (NC(V)) and N1 – N6 courses. The various vocational courses will get Grade 10 to 12 learners off to a flying start on a career path and access into higher levels of studies. The qualification achieved will provide the student with access to higher education and lifelong learning. The N1 –N6 courses are courses that allow the student to qualify with a National Certificate or a National Diploma and include courses in business studies, engineering studies and general studies courses such as tourism, clothing production and hospitality and many more. and latest exam or school results. the applicant must also declare the total household income. Northlink College is proud to have achieved the recognition of the South African Bureau of Standards (SABS), as well as ISO 9001 accreditation. This accreditation proves that Northlink College truly lives up to its mission of providing quality, relevant and accredited education and training which addresses the skills and developmental needs of all stakeholders.